R' Yaakov Yitzchak: Though in his humility he rarely lifted up his eyes, he saw so deeply, with such clarity of vision, that he was known as the Chozeh, the "seer" of Lublin. R' Yisrael Haupstein, the Maggid of Koznitz: So revered was he, that Chassidim called him "the second Ba'al Shem Tov." Rav Avraham Yehoshua Heschel of Apta: A direct ancestor of Rabbi Dr. Twerski, he reached new heights in lovingkindness. At his request, his tombstone bore only his name and the legend "oheiv Yisrael" - one who loved the People of Israel. R' Menachem Mendel of Rumanov: A man of deep spirituality, together with his unusual attendant, Reb Zvi Hirsch, he discovered the essence of humility. 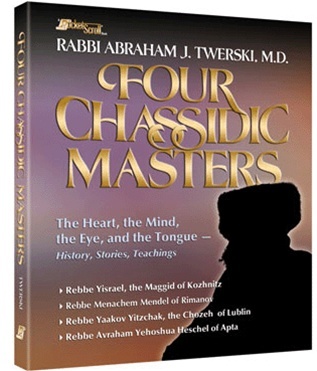 In Four Chassidic Masters, Rabbi Dr. Twerski combines his deep, first-hand knowledge of Chassidic lore with insights into our own lives. 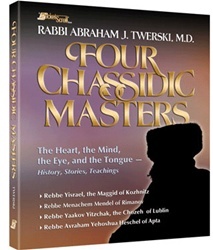 Here are fascinating biographical sketches of four great men, together with summaries of their teachings and, most stirring of all, the Chassidic stories that have been told of them, passed down through the generations. In his own inimitable fashion, Rabbi Dr. Twerski brings to life these four men, whose influence is felt to this very day.